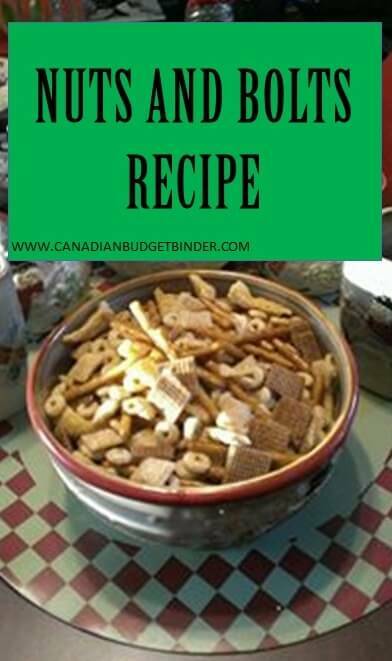 If you’ve thought about making a homemade Nuts and Bolts Recipe for the holidays also known as a “cereal snack mix” check this easy recipe out. Last week this gorgeous Nuts and Bolts photo showed up on my What’s For Dinner post on Facebook and I knew I wanted to share it on the blog with all of you. My wife has asked me for years to create my own Nuts and Bolts Recipe but I’ve always put it last on the baking list. I’ve had many different versions of the Nuts and Bolts Recipe over the years but mainly around the holidays. The salty flavour of the Nuts and Bolts pairs perfectly with a lovely holiday beverage. I still prefer a cold beer. Some people also put chocolate in their Nuts and Bolts Recipe once cooled down to add a sweet element to this popular snack. Others eliminate the nuts like this recipe has which also keeps the costs down. If there is someone who cannot eat nuts this snack may work well for them. When my wife was younger she remembers a best friend of hers whose mother would make several big batches of her famous Nuts and Bolts Recipe every Christmas. She recalls her saying how pricey it was to make as she would buy her ingredients at the Bulk Barn which can get pricey at the best of times. Her Nuts and Bolts Recipe was filled with various nuts such as Brazil nuts, cashews, almonds, peanuts and cereals which took a chunk of the expense. She would lace the already decadent Nuts and Bolts with inexpensive pretzels and BBQ Fritos which can get pricey unless you can find them on sale at the grocery store closer to the time you make your Nuts and Bolts. Once she finished making the Nuts and Bolts she would scoop some into plastic bags and tied them with ribbon and add a homemade Christmas label. Anyone who came over to visit for the Christmas holidays went home with a bag of Nuts and Bolts and a bottle of homemade wine. Everyone had come to love her Nuts and Bolts Recipe and my wife said there was always a full house come the holidays. A tradition was born but no one ever got her secret recipe apparently. Today CBB fan Colleen shares her traditional Nuts and Bolts Recipe with all of us below along with the gorgeous photo above that she took of a recent batch she made. As you will see the ingredient list has no nuts included but there are many kinds of delicious cereals in this snack mix along with pretzels and bugles. Eliminating nuts helps to keep costs low. You could easily add a can of peanuts or other nuts to the recipe if you prefer but you’d need to alter the coating amount which should be fairly straightforward. If you find the spices to be too much for your liking you can adjust them too. This recipe is versatile which is great. You can make different batches for the Nuts and Bolts lovers in your house as Colleen points out below. This Nuts and Bolts Recipe has been a family favorite in our house for years during the holidays. I must admit though that over the lean years I haven’t made them, simply because the extra money wasn’t there for the pricier ingredients. That being said, this Nuts and Bolts Recipe is one which I have created for the picky people in my family which eliminates the nuts but replacing them with Cheerios. There are a couple of people in my family that don’t care for my Nuts and Bolts Recipe but that is because they don’t care for any of the ingredients. It’s just not their cup of tea, which is fine by me. Here is my version of the popular Nuts and Bolts Recipe, a holiday treat that is perfect for entertaining at home or giving away as gifts. You can bet you will have nothing left after the holidays so enjoy them while you can. If you would like to add your favourite nuts such as almonds, cashews, peanuts,Brazil nuts, hazelnuts, pecans or walnuts you can roast them and add them after which I find is easiest. You also have less opportunity to burn anything. To roast nuts put on a baking sheet at 300 degrees and stir every 3-4 minutes so they don’t burn. I typically stand by the oven as nuts are pricey so you don’t want to mess up roasting them. Feel free to salt and season them once they come out as the nut oils will be released but do it right away. Another CBB fan Samantha Joan is sharing her Nuts and Bolts recipe too!! I just fill my large oval roaster, no real measurements. It’s roughly 1/3 box cereal, 2 bags of pretzels, a bag of goldfish, a bag of bugles, 2-3 bags cheezies and then I just dump the nuts in. Melt the butter and mix in the seasonings. Pour over the treats and stir. Cook for 2 hours at 250F, stirring every half hour. Let cool then enjoy. 2 tsp of Worcester sauce. I put a bit extra celery salt too because I like salty. Mix all of these together in a large roaster. Mix the sauce ingredients for the Nuts and Bolts well. Drizzle over the Nuts and Bolts and stir to coat. Place covered roaster in oven preheated to 225 F.
Bake the Nuts and Bolts for 2 hours in covered roaster, stirring the Nuts and Bolts every 20 min. Remove from oven and while cooling stir the Nuts and Bolts a couple of times while cooling. This recipe for Nuts ‘n Bolts makes 2 ice cream pails full. Homemade gifts for the holidays are a great way to add your personal touch while spreading love and happiness to those people who are special in your life. Store your Nuts and Bolts in sealed containers and enjoy them before they are all gone. It actually looks so delicious, Mr. CBB. I love Pretzels. Dried fruits are really good for this Nuts and Bolts Recipe. These do look mighty good!! Wonder what else I could add to these and replace some of the cereal….. Hubby loves his Cheerios and pretzels!! This has possibilities for fudging!!! Thanks Colleen!! You can add nuts for sure, chocolates once they cool, dried fruits… yes you can play around with it. It’s a great way to give homemade gifts too.